Multi-tenancy is a fundamental architecture which can be used to share IT resources cost-efficiently and securely in cloud environments, in which a single instance of software runs on a server and serves multiple tenants. It’s been years since we first heard about it; it came out again riding the wave of cloud computing, so we can assume that multi-tenancy is a consolidated architecture and the benefits in terms of maintainability and costs are well known. APIs are the backbone of a distributed cloud architecture, so building a multi-tenant API is the natural aftermath in this scenario. In this article I will show you how to build a simple multi-tenant RESTful API using Java in a quick and easy way, dramatically reducing the configuration code amount required by the most frequently adopted solutions. The first impression, looking for multi-tenancy implementation strategies, is that there’s no specific standard and no well defined best practices. One of the most common solution is relying on Hibernate to implement multi-tenancy behaviour at DataSource level. Hibernate requires two interfaces to be implemented: CurrentTenantIdentifierResolver to resolve what the application considers the current tenant identifier and MultiTenantConnectionProvider to obtain Connections in a tenant specific manner. This could be tricky and not so trivial, possibly leading to boilerplate code rising. And finally, last but not least, this solution is only suitable for a JPA implementation, since Hibernate is directly used as tenant resolver and connection router. Furthermore, the Spring Framework is often used in conjunction with Hibernate to build a multi-tenant API or application. One of the most useful aspects of the core Spring architecture is the availability of scopes: in a multi-tenant scenario, sooner or later you’ll surely miss a tenant scope, which is not available out-of-the-box. Creating a custom scope in Spring is not trivial, it requires a deep knowledge of the Spring architecture and a lot of code to implement and register the new scope. You can check the Spring+Hibernate version of the example shown in the second part of this article here: https://github.com/fparoni/spring-boot-hibernate-multitenant-jaxrs-api. Now let’s streamline the process, in order to highly simplify the multi-tenancy setup and to cut down the required configuration effort, getting rid of all the boilerplate code. We will use the Holon platform to achieve this goal, relying on the platform’s native multi-tenant support. The complete example is available on GitHub: https://github.com/holon-platform/spring-boot-jaxrs-multitenant-api-example. Our RESTful API implements the CRUD operations to manage a simple Product, providing methods to create, update, delete and query the product data. The multi-tenancy architecture of this example is organized per schema: each tenant is bound to a separate database schema and will access data through a different Java DataSource. Each time an API request is performed we need to know the caller tenant identifier, to correctly route the persistence operations to the right database schema. We will use the second option, through a custom HTTP header called ‘X-TENANT-ID’. An example to use JWT to provide the tenant identifier is available in the jwt branch of the GitHub example repository. The Holon Datastore API will be used to access data in a technology-indipendent way (using JDBC in this example is only a matter of configuration) and the Holon Property model to define the product data model. Check to Holon reference documentation for detailed information. The result will be a fully working example made of just three Java classes: now let’s build our example step by step. First of all, we will use Maven for project configuration and dependency management. We’ll use the Holon Platform BOM (Bill of Materials) to easily obtain the dependencies we need. Likewise we declare the Holon JAX-RS Spring Boot starter dependency to use and auto-configure Jersey as JAX-RS implementation. To configure our Spring application we will use an application.yml configuration file. We simulate that two tenants are available, the first bound to a schema named tenant1 and the second associated to a schema named tenant2. So we need two DataSource instances, one for each schema. By default, for each auto-configured DataSource, a Holon JDBC Datastore is created too. Each DataSource/Datastore pair will be available as a Spring bean and qualified with the name specified through the holon.datasource. * properties. For example, the DataSource bound to the first tenant can be injected in a Spring component using the @Qualifier(“tenant1”) annotation. To be up and running at startup we will use a couple of .sql file to create a sample table named ‘product’ and one row for each tenant. As I said before we need just 3 Java classes. A TenantResolver implemetation to provide the current tenant identifier and to enable the Holon platform tenant scope. In this example, we want to use a custom HTTP header named “X-TENANT-ID” to obtain the tenant identifier from the caller. We need the current HttpServletRequest to obtain the header value, so we declare the TenantResolver as request-scoped and rely on Spring to obtain a reference to the current request. A tenant-scoped Datastore is correctly retrieved by Spring through the tenant identifier which acts as bean qualifier. The two Datastore instances have already been configured by the Holon Platform Spring Boot autoconfiguration facilities, using the two DataSources declared through the holon.datasource. * configuration properties. The current tenant-related Datastore is retrieved using the bean qualifier which matches with the current tenant id, provided by the TenantResolver interface. The Holon platform Property model is used to define the product data model. Deepening this topic is out of the scope of this article, check the official Holon documentation for further details. * Get a list of products PropertyBox in JSON. * Get a product PropertyBox in JSON. * Delete a product by id. Note that we injected the Datastore instance to perform data access operations: thanks to tenant scope with which the Datastore bean is declared, we’ll obtain the right Datastore instance according to the current tenant identifier. We’ve seen how to setup a multi-tenant API quickly, highly reducing the configuration effort and boilerplate code that is often required for this kind of task. The multi-tenant architecture that we’ve used in our simple API implementation can of course be leveraged for other, more complex, services or applications. The source code of the application can be found at https://github.com/holon-platform/spring-boot-jaxrs-multitenant-api-example. Information security is one of the most importart concerns facing an increasily connected world. And since APIs are the glue of the digital landscape, API security is more important than ever. In this scenario, user identity and access management are core concepts to deal with. In API architectures, in particular with the emerging microservices approach, the real challenge is to enable a strong security and identity management support while keeping efficiency and reliability. In a microservices environment, the services are scoped and deployed in multiple containers in a distributed setup, and the service interactions are frequent and remote, mostly over HTTP. In this distributed and stateless world, even the user identity has to be managed in a distributed and stateless way. What we need here is a solution that allows reliable user identity management and authorization checking without additional overhead, and using the JSON Web Tokens (JWT for short) can be the answer. Performance and easy distribution: The JWT representation is compact, and thanks to its small size, the trasmission of a JWT token is fast and can be effectively performed using the HTTP protocol, for example using a URL, POST parameter, or inside a HTTP header. Efficiency: A JWT token is self-contained, carrying in its payload all the identity information (including authorizations), avoiding the need to perform additional calls (for example a database query) to obtain user information. Simplicity and standardization: JWT is an open standard and uses JSON to represent the identity information, a widely used and supported data format. Granular security: With JWT you can provide fine grained resource access control. Debuggability: JSON Web Tokens can be easily inspected, differently for example from an opaque API key. Expiration control: A JWT supports an expiration time, easy to set and control. OAuth2 compliance: OAuth2 uses an opaque token that relies on a central storage. You can return a JSON Web Token instead, with the allowed scopes and expiration. I’ll take the simple API application example of my previous article, Spring Boot, Jersey, and Swagger: Always Happy Together, as a starting point to show you how to use the Holon Platform to secure API operations using JWT. The Holon Platform JWT support relies on the jjwt library to encode, decode and verify the JWT tokens. The source code of the updated example API application can be found on GitHub, in the jwt branch of the spring-boot-jaxrs-swagger-api-example repository: https://github.com/holon-platform/spring-boot-jaxrs-swagger-api-example/tree/jwt. In a typical scenario, the JSON Web Tokens emission, interchange and consumption process involves at least three actors: the issuer, the protected resource and the client. The issuer is in charge to issue a JSON Web Token as a response to a valid authentication request. This step can include the user account credentials validation. The produced JSON Web Token can contain detailed user information, including for example user profile information and authorizations, in addition to system and validation related data, such as the issuer name and the expiration time. These information are called claims in the JWT terminology, and they constitute the JWT payload. In addition to the set of reserved claims, you can provide a number of custom claims to represent the user identity and account information. The issuer role can be easily intepreted by a OAuth2 UAA (User Account and Authentication) server, which returns a JWT instead of an opaque and randomly generated token. In this example, we’ll simulate the JSON Web Token generation by a UAA server, using the Holon Platform authentication and authorization APIs from a JUnit test class. The Holon Platform authentication architecture relies on the Authentication interface to represent the authenticated principal (which can represent an user but also another entity). The Authentication structure supports permissions to represent the authorization grants and generic parameters to specify the account details. To build a JSON Web Token from an Authentication, the JwtTokenBuilder class can be used. This builder will translate the Authentication permissions and parameters into JWT claims. The JWT token builder needs to know which kind of token to build (signed or not), which algorithm has to be used to sign the token and any additional reserved claim (such as the token unique id, the issuer name and the expiration time) to add to the token itself before encoding it. This information can be collected and provided to the builder using the JwtConfiguration interface and the Holon Platform Spring Boot support can be used to build a JwtConfiguration using the application configuration properties. Now we can use a set of Spring Boot configuration properties, with the holon.jwt prefix, to auto-configure a JwtConfiguration instance which will be made available as a Spring component. The list of all the configuration properties is available here. In this example, we want to setup the issuer name to be used, the expiration time and the signature algorithm to use. For the sake of simplicity, in this example we’ll use a symmetric signing algorithm (HMAC with SHA-256), so we only need a single secret key, which has to be shared between the parties. The expire-hours property is used to specify an expiration time of one hour, but other configuration properties are available to use a different unit of time (for example expire-minutes, expire-seconds, expire-ms). From now on, we can simply obtain the JwtConfiguration which represents these configuration properties as an injected dependency. This token can be easily transmitted using the HTTP protocol, using for example an Authorization header. See this example for a simple JWT authorization server which issues JSON Web Tokens as the response of a POST invocation providing username and password using the HTTP Basic scheme authorization header. Now it’s time to protected our API operations using JWT. We’ll leverage again on the Holon Platform authentication architecture, using the Realm security abstraction and the Holon Platform Spring Boot support to allow API resources access only to authenticated clients. We’ll use HTTP Authorization header with the Bearer scheme to obtain the JWT provided by the client. The JSON Web Token will be validated according to the JWT configuration properties (checking the sign, the issuer name and the expiration time), then the JWT claims can be used to obtain the required user identity information. We want to implement a simple authorization control too, so the permission claims will be used to obtain the user roles and check if it was granted to access an API operation. An AuthenticationTokenResolver to translate the JWT into an authentication token which can be interpreted by the Realm’s authenticators. The Authenticator which the Realm has to use in order to perform the account authentication. An Authorizer, responsible for authorization control. The default Authorizer relies on the Authentication permissions to check the user authorization against the required permissions/roles. The JwtConfiguration bean is automatically created using the application confguration properties as seen before. A resource method annotated with @Authenticate is only accessible by a valid, JWT authenticated, client request. If the @Authenticate annotation is declared at class level, all the JAX-RS class methods inherits the authentication setup. If the authentication is not present or not valid, a 401 - Unauthorized status error response is returned. The JAX-RS SecurityContext of an authenticated request returns the Authentication instance associated to the request from the getUserPrincipal() method. The Holon Platform translates back the JWT claims into the Authentication permissions and parameters, so they can be simply accessed from the JAX-RS method. The standard javax.annotation.security. * annotations (@PermitAll, @DenyAll, @RolesAllowed) are enabled to perform role-based resource access control, using the Authentication permissions provided by the JWT. If authorization control is not successfull, a 403 - Forbidden status error response is returned. For more advanced authorization controls, the Realm component can be injected in the JAX-RS endpoint to leverage on the Realm API operations using the current Authentication. The last actor is the client, which obtains the JSON Web Token from the issuer and uses it to perform the API calls, providing it as HTTP Authorization header Bearer token. In a service-to-service communication scenario, the JWT obtained from the original API request can be passed around to perform additional inter-service calls. No additional overhead, such as querying the database, is needed to obtain the identity information, which is encapsulated in the JWT payload. See the ApiTest class to learn how to use the Holon Platform RestClient to perform RESTful API invocations providing the JWT as Authorization header Bearer token. In the previous post, we’ve seen how to use the Holon Platform Swagger support to create and provide a standard API documentation. Now we want to complete the API documentation, adding the authorization information. Swagger specification version 3 will be used in this example. Let’s suppose to use OAuth2 to obtain the JWT bearer token. In this example, the OAuth2 authorization server is available at the https://example.org/api/oauth2 URL. Our authorization example roles (ROLE1 and ROLE2) will be represented as OAuth2 scopes. We’ve seen how JWT can be a lightweight and versatile alternative to other traditional authentication systems, mostly in the stateless API and microservices world, and how the Holon Platform can make its implementation simple and reliable. The source code of this example API application can be found on GitHub, in the jwt branch of the spring-boot-jaxrs-swagger-api-example repository: https://github.com/holon-platform/spring-boot-jaxrs-swagger-api-example/tree/jwt. 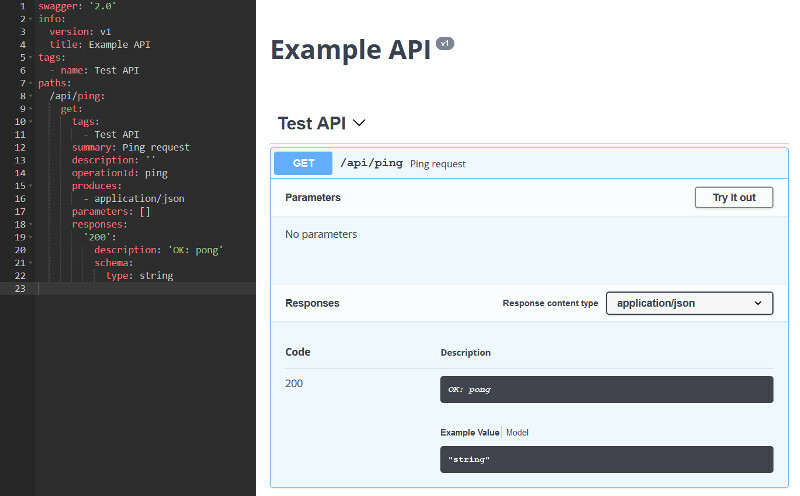 See the previous post to learn how to create the API example application using Spring Boot, Jersey and the Holon Platform JAX-RS module. From a development point of view, it’s crucial to achieve target whilst ensuring the fulfillment of the following requirements: timing, costs saving and quality. Standardization is one of important way to achieve those goals: to ensure consistency, speed-up development, enable factorization and simplify maintanance. In this post, we’ll start from the beginning, showing how to create a simple API service. We’ll focus on project setup and configuration, leaving out the API business logic concerns. In fact, this API will provide a single “ping” operation, which will respond with a pong message. Maven is used for project setup and dependency management, so let’s start with configuring the project’s pom dependencies. First of all, we import the Holon Platform BOM (Bill Of Materials), this way we’ll no longer need to specify the Holon Platform artifacts version. The right version of each artifact is declared and provided by the platform BOM. These Holon Spring Boot starters inherit the standard Spring Boot web starters, and provide embedded servlet container configuration, logging and Holon specific auto-configuration facilities. By default, Tomcat is used as embedded servlet container. Want to use Undertow? Just change the starter name (for example, holon-starter-jersey-undertow). Concerning JSON data format instead, Jackson is automatically setted up. What if Gson is your preferred choice? It’s only about changing a name, again (for example, holon-starter-jersey-gson). 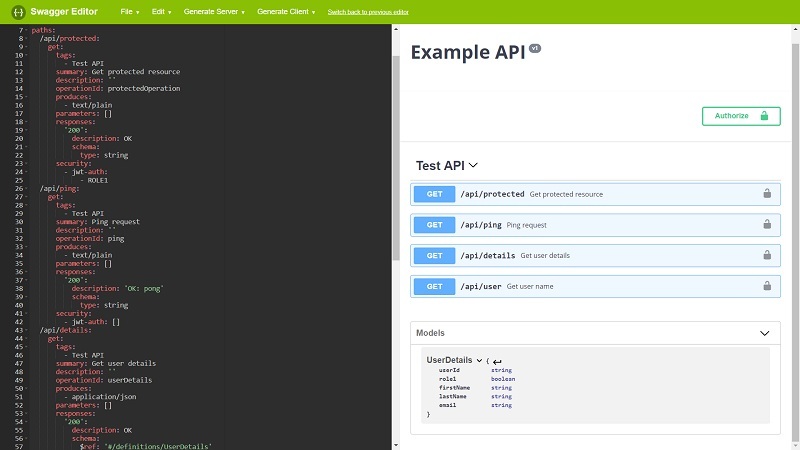 We’ll use Swagger for API documentation. The Swagger specification is now the foudation of the Open API Initiative, which is trying to standardizing on how REST APIs are described. But wait… things do not go as we expected: the server renponds with a 404 (not found) error code! Why? With 2 Java classes, a pom and a Spring Boot configuration file we setted up a production grade API application, able to be runned standalone, with API documentation and monitoring capabilities. Now it’s time to focus on business tasks, making the API somehow useful!